Two LTA students placed 1st & 2nd in the 2016 Charleston Youth Marathon Design Contest. 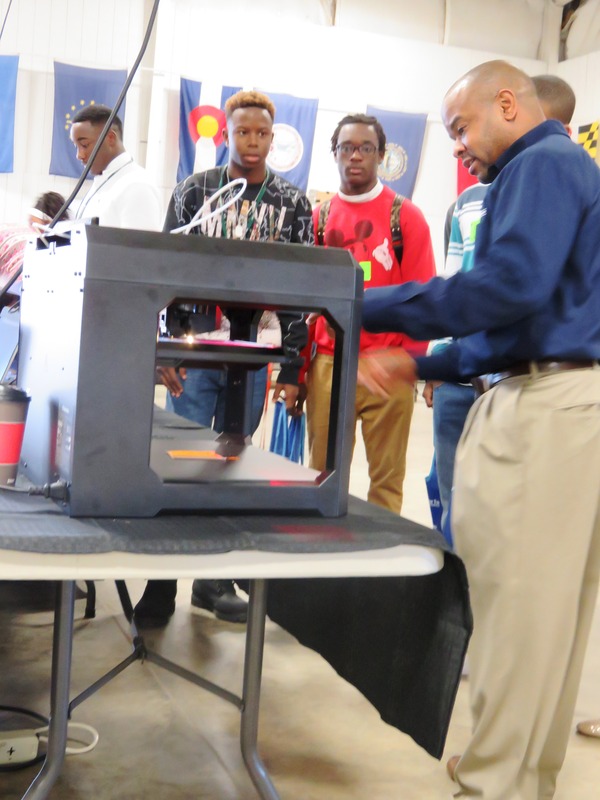 This competition was open to all CCSD students and, according to event organizers and the selection committee chair, hundreds of designs were received from all across the district. 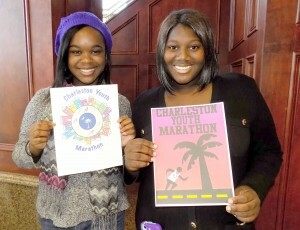 Designs submissions were required to include elements that represent Charleston, Youth, and/or Fitness and Running. 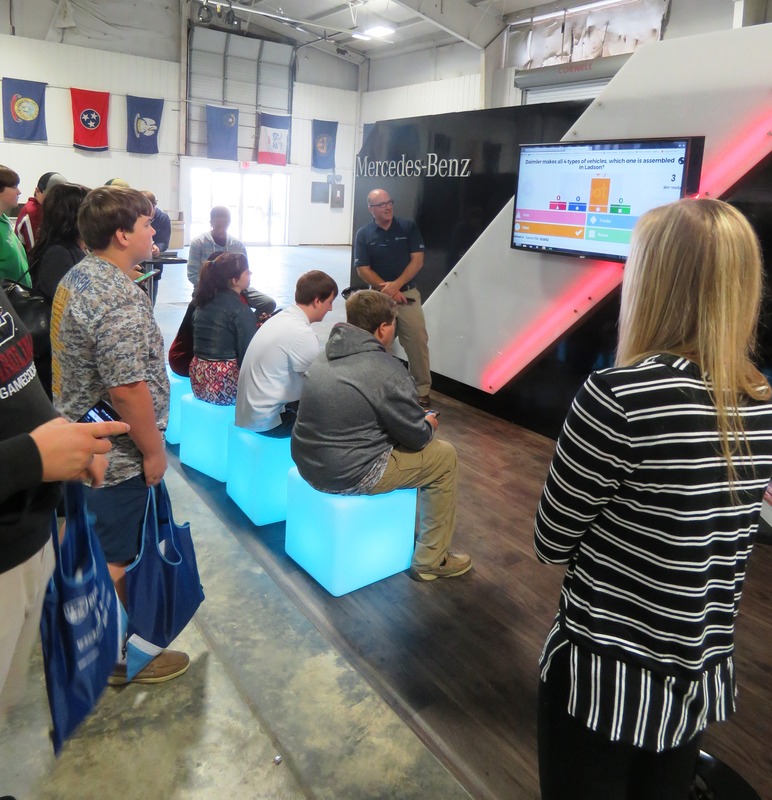 Color was also an important consideration in the selection of design winners. 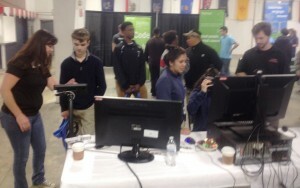 Both high school winners were from Ms. Liz Tonelli’s Digital Art & Design classes at Lowcoutnry Tech Academy and both also represented Burke High School as their home school. 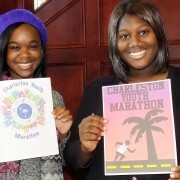 Tyeshia Williams’ design placed 1st; she received a $100 prize and her design will be reproduced on the official Youth Marathon T-Shirt. 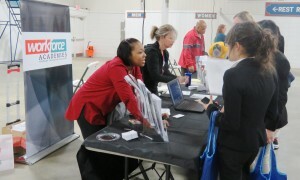 The 2nd place winner of a $50 prize was Tamara Snider. 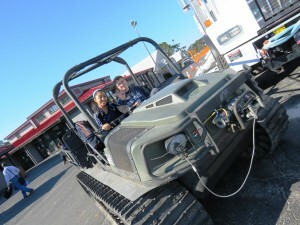 Her design will be used for the medal that marathon participants receive. 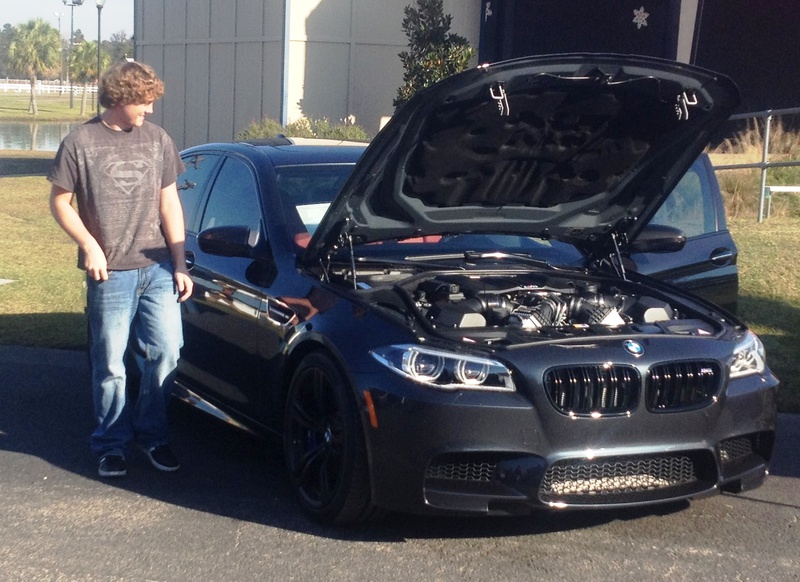 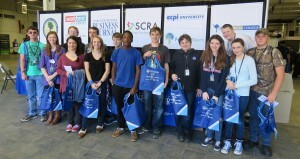 Congratulations to both students on their hard work and success! 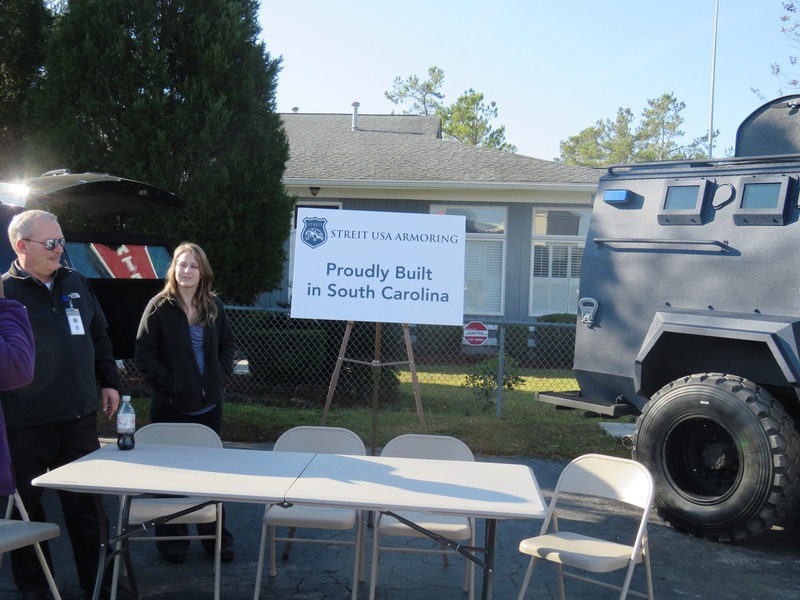 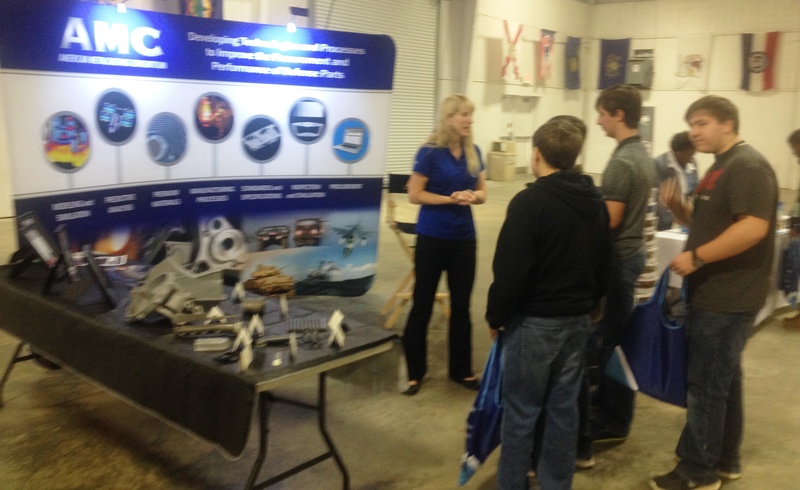 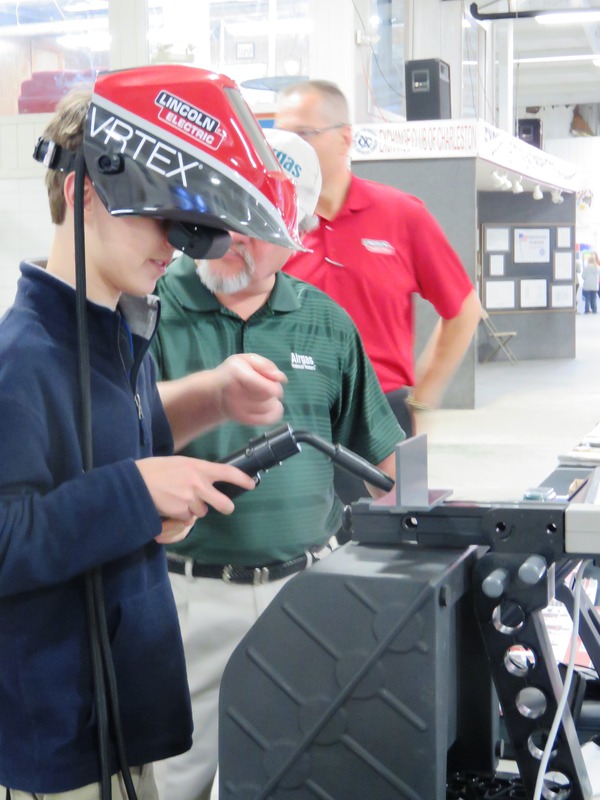 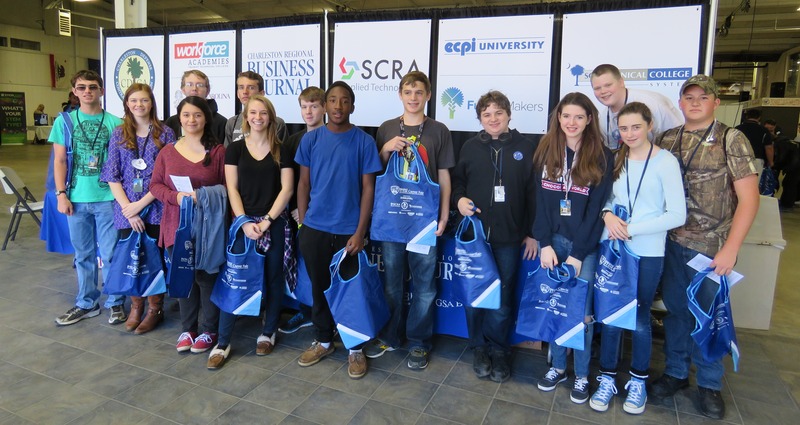 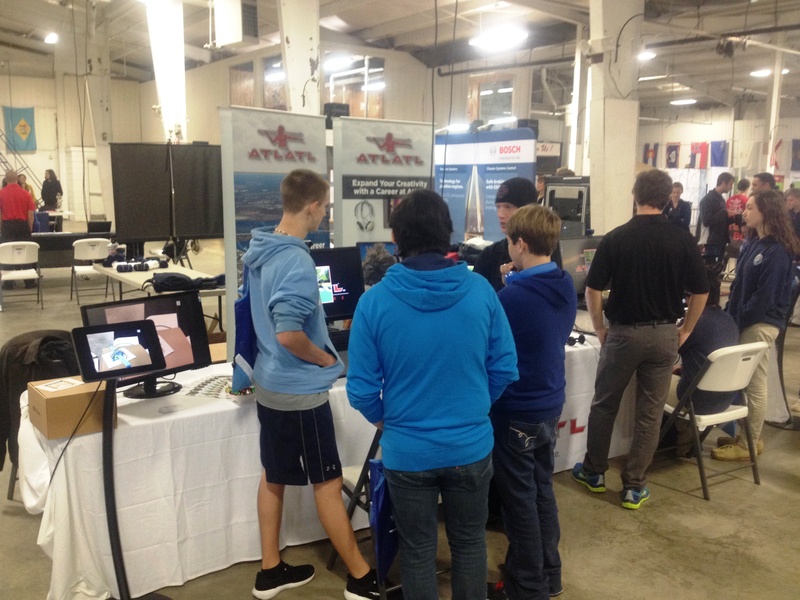 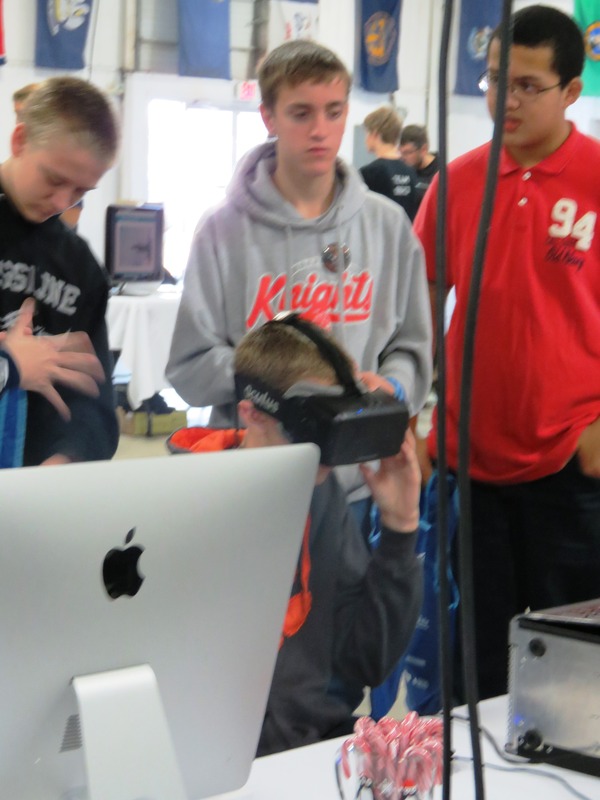 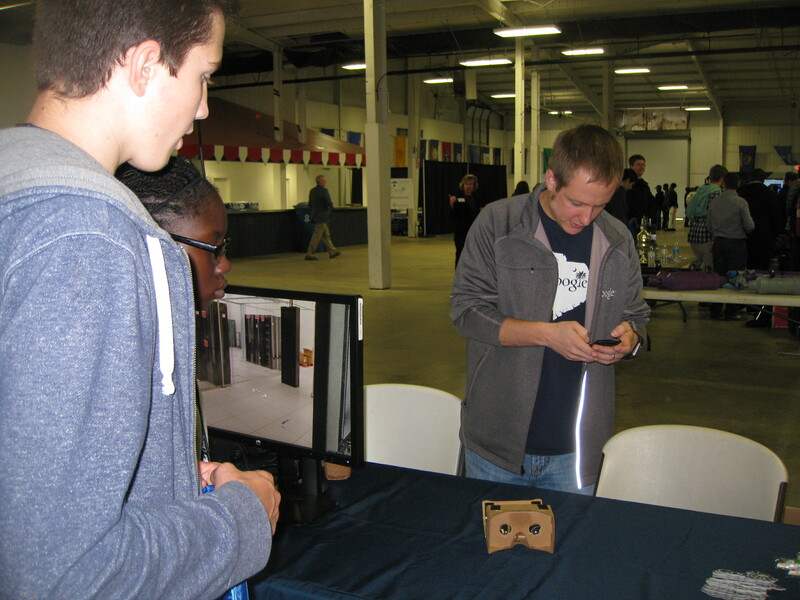 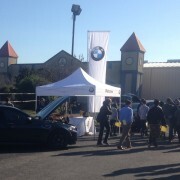 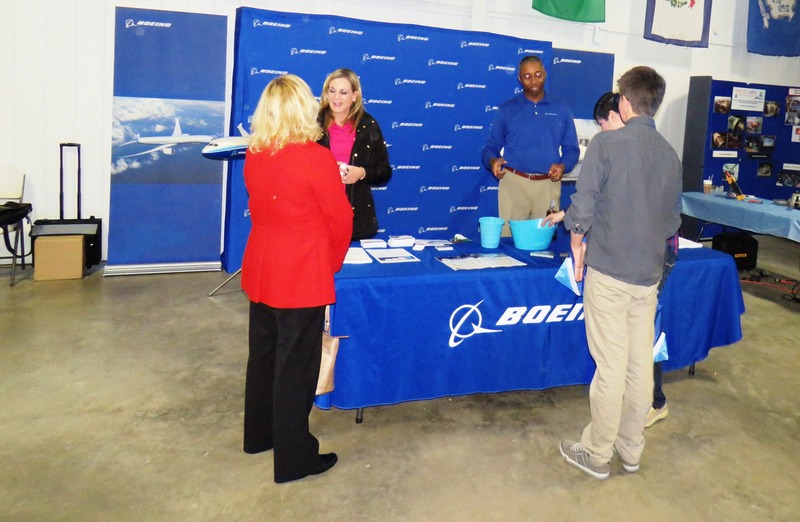 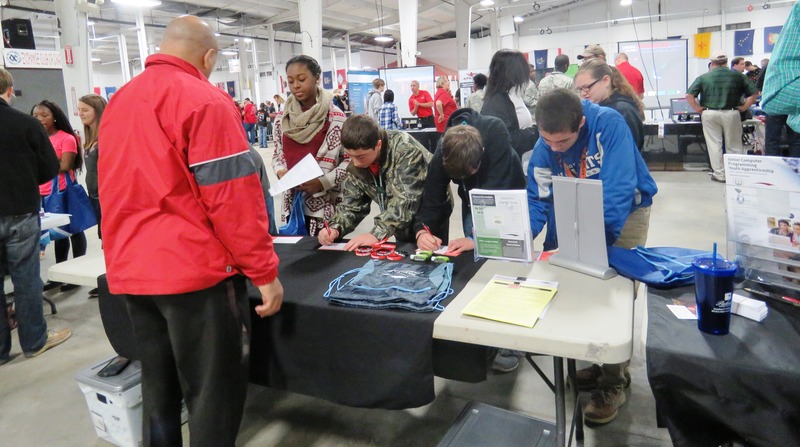 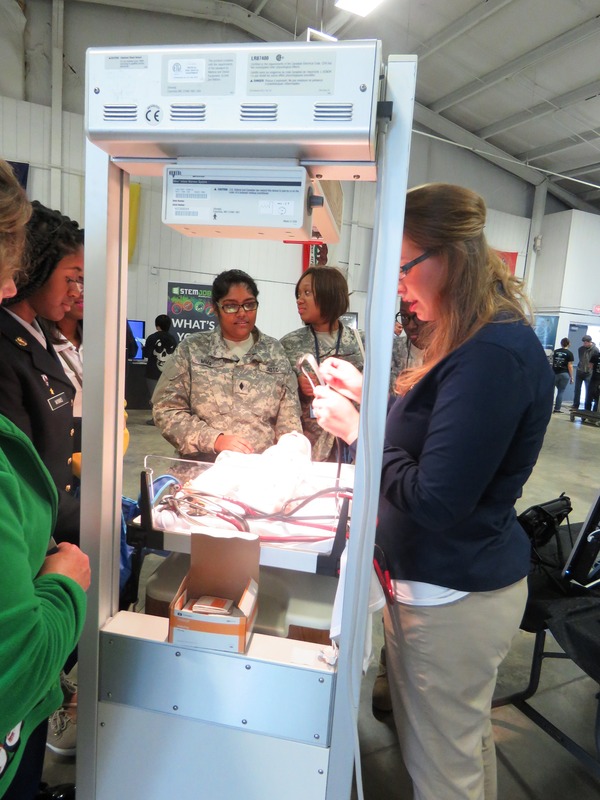 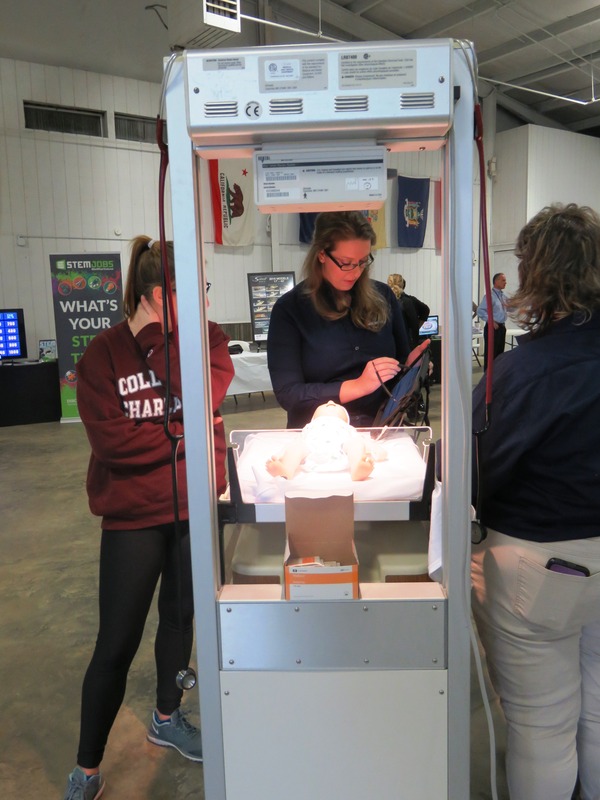 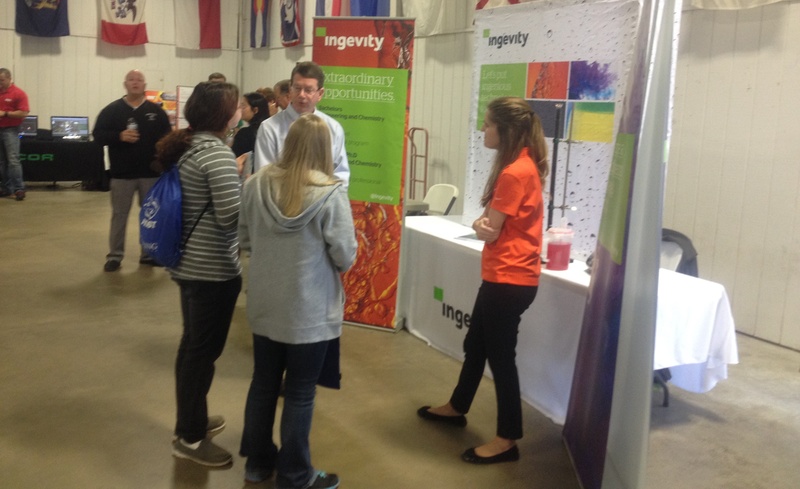 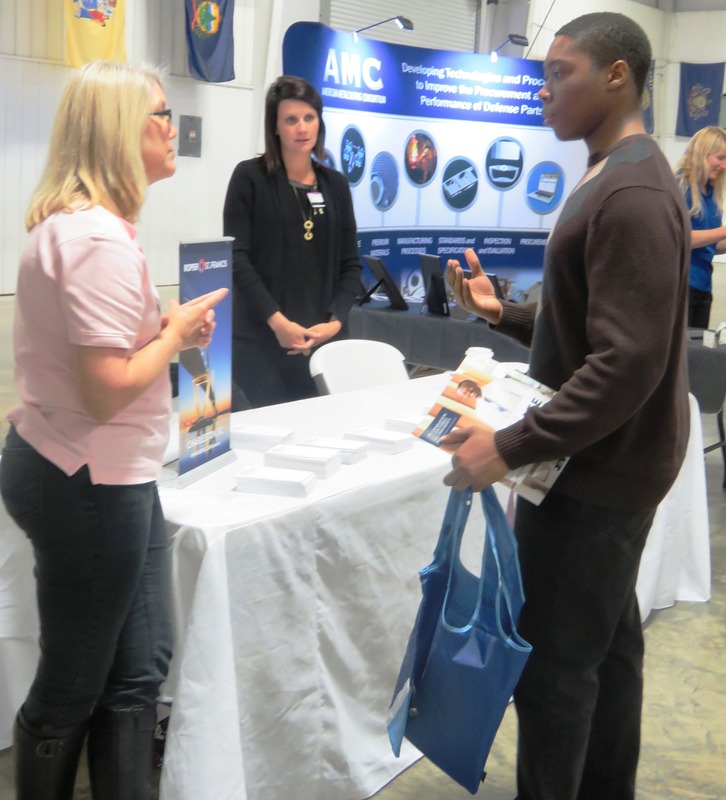 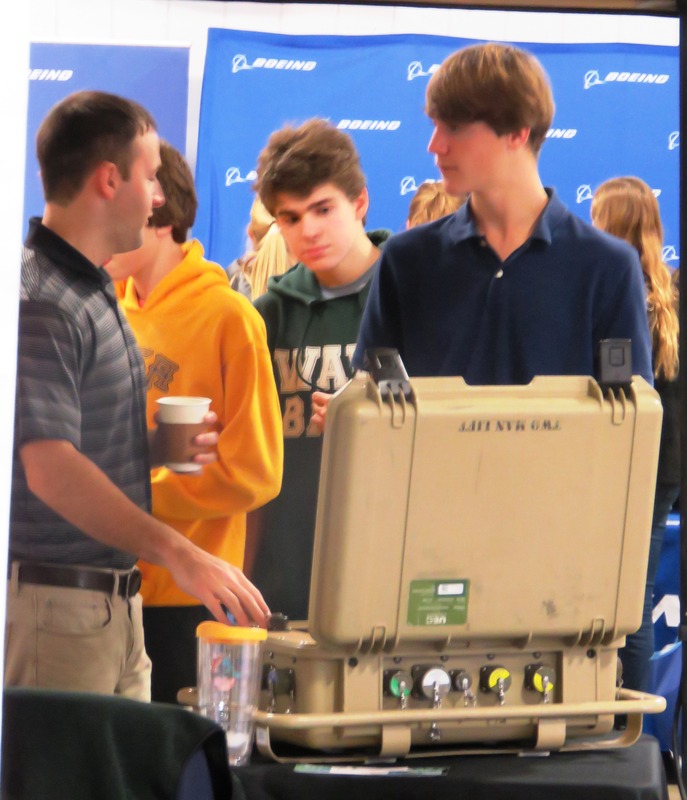 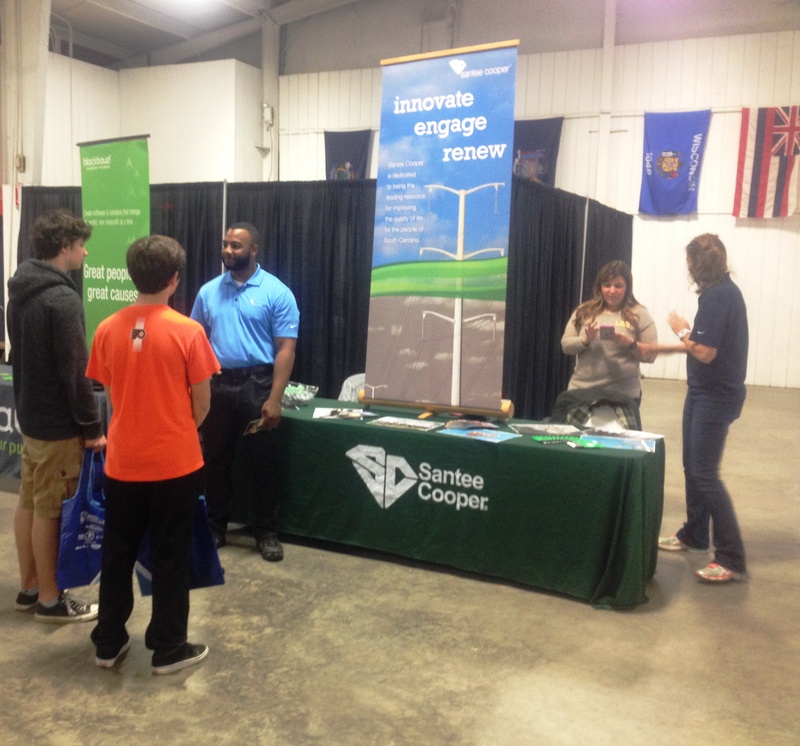 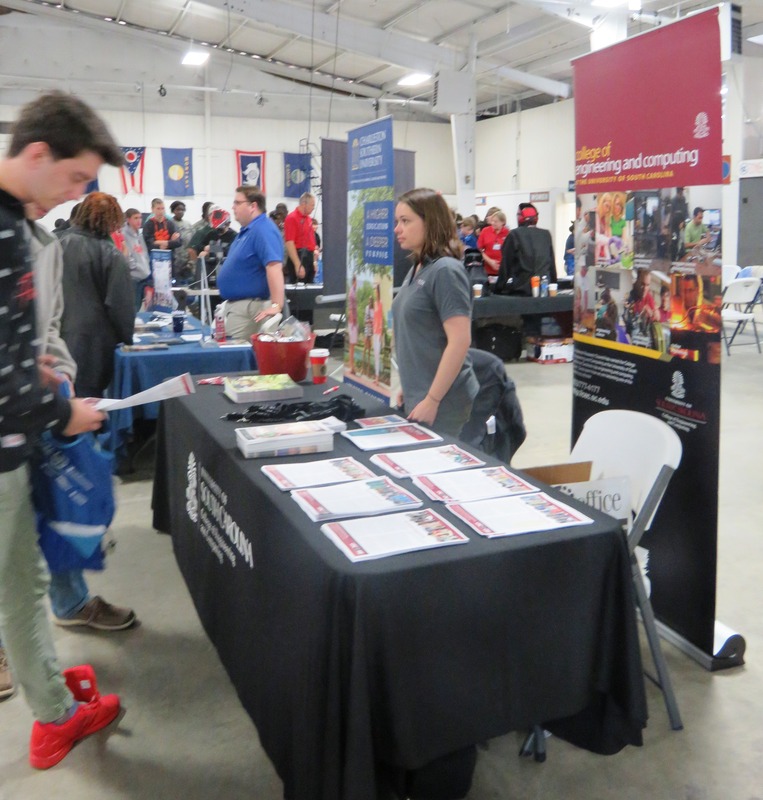 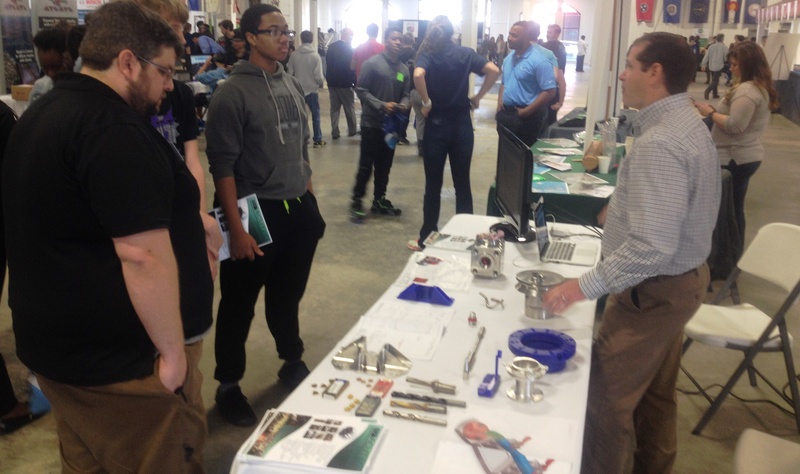 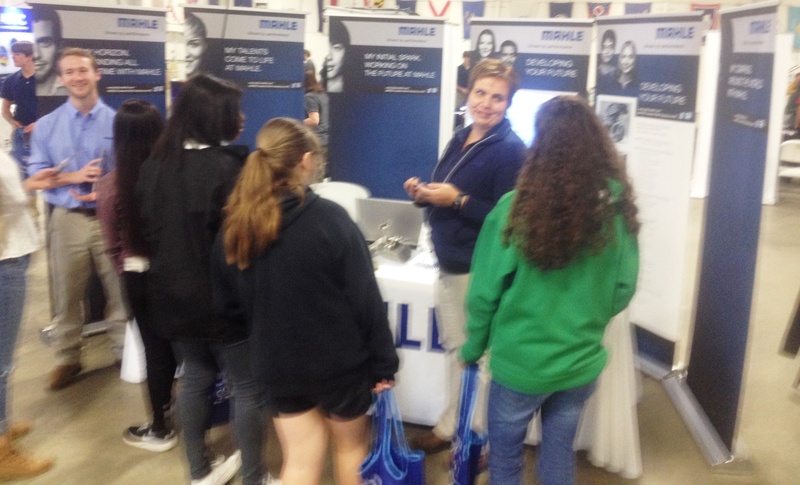 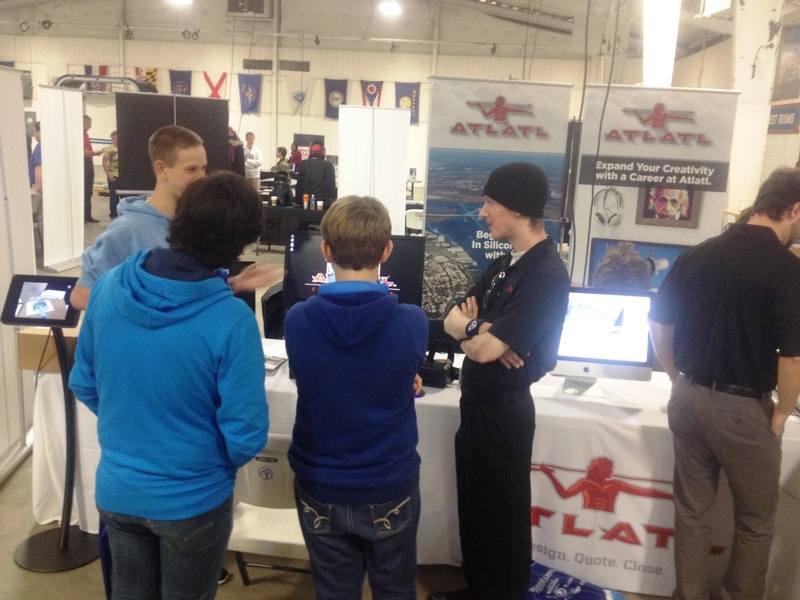 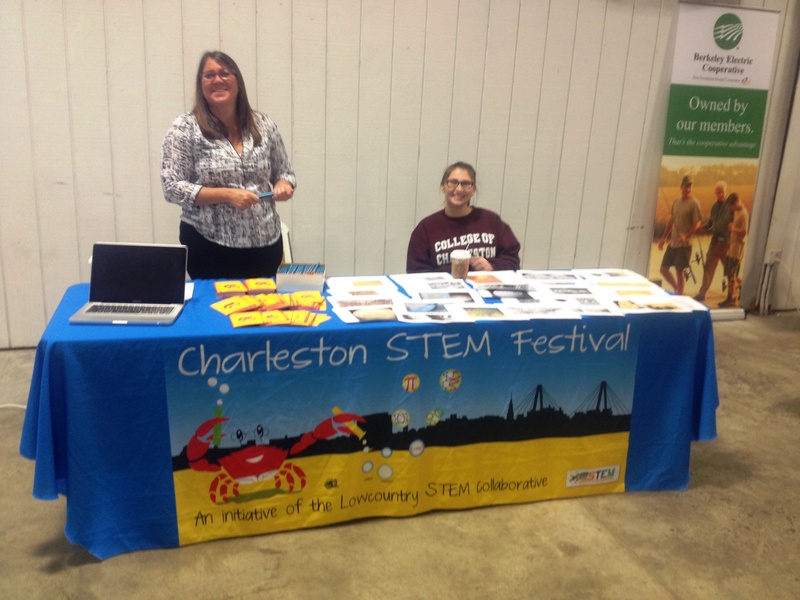 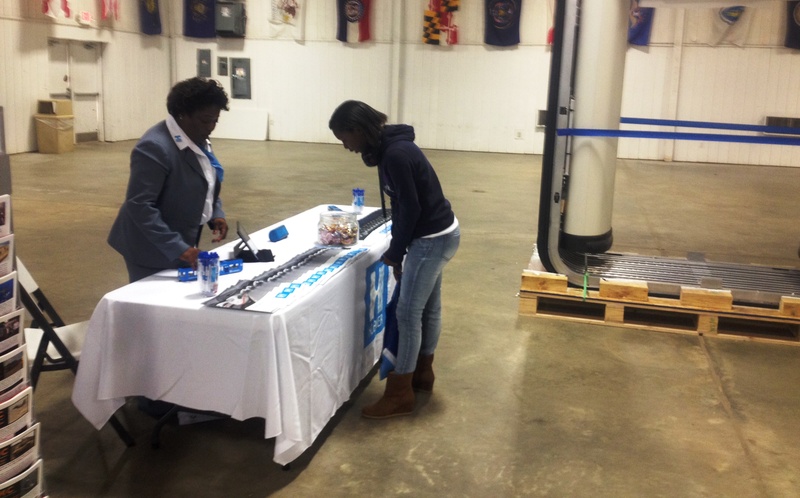 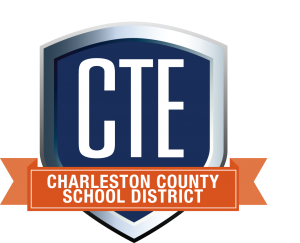 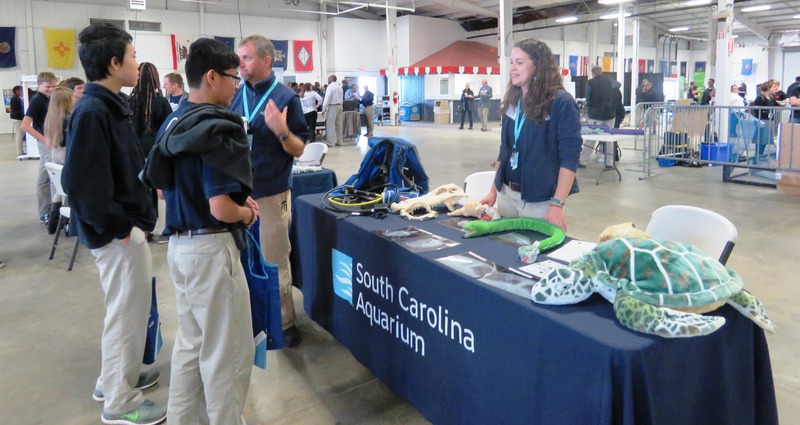 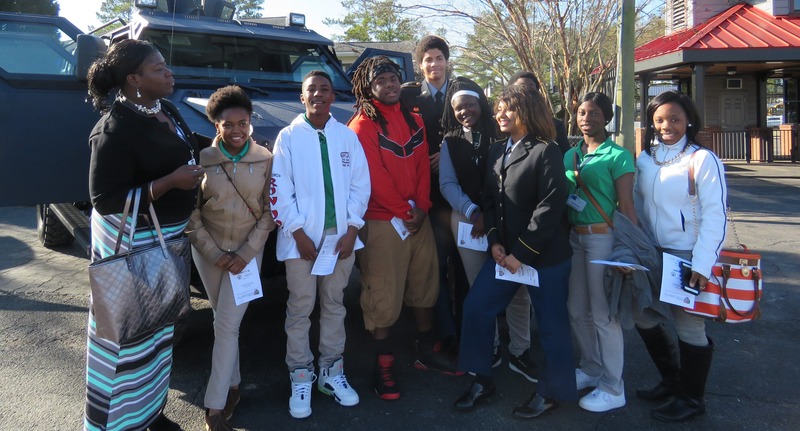 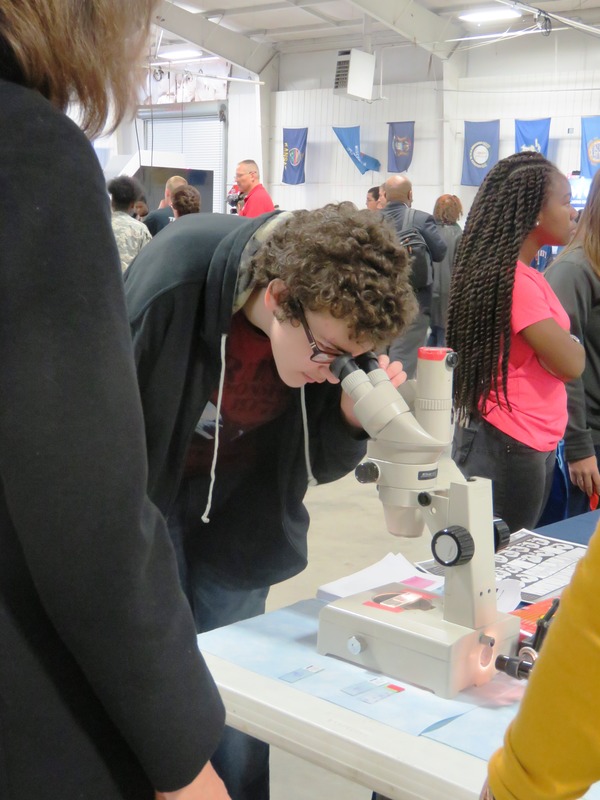 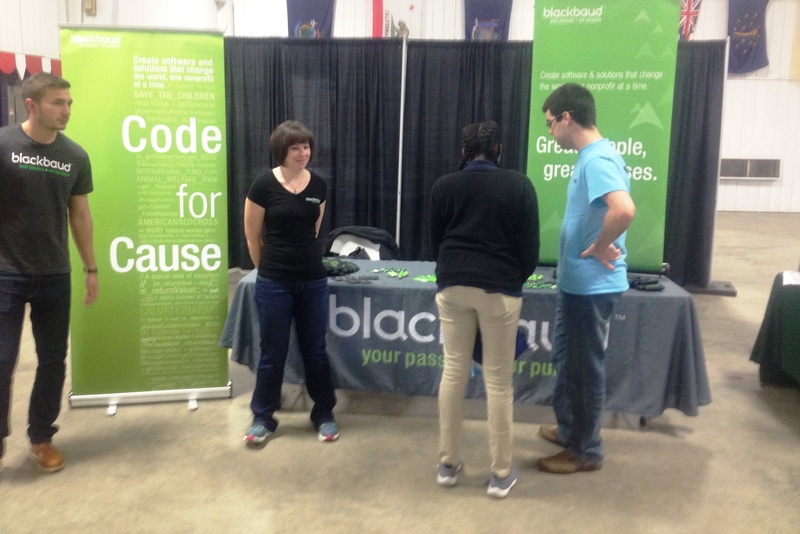 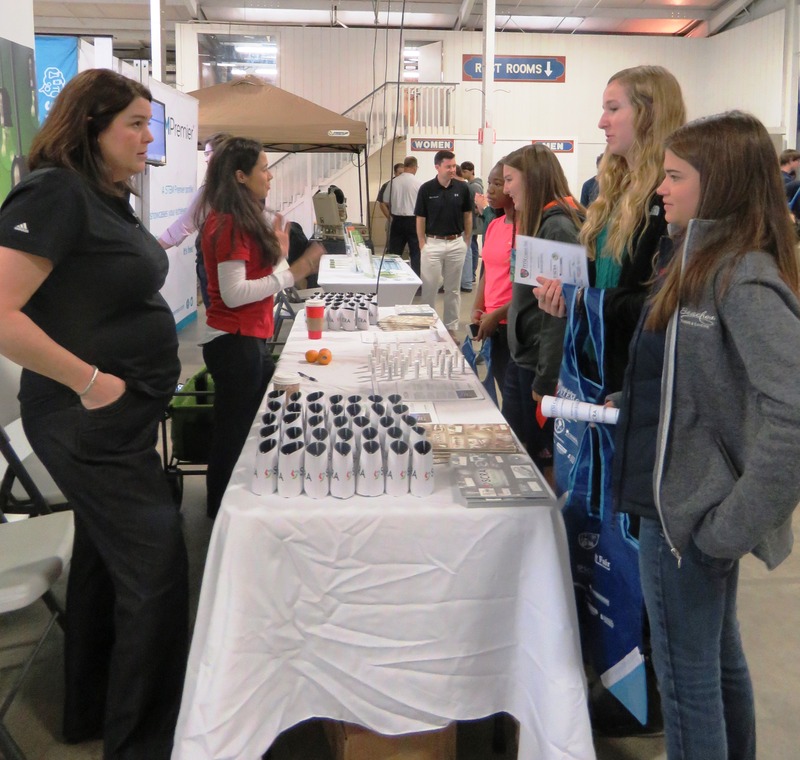 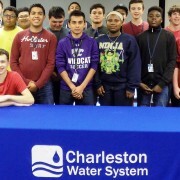 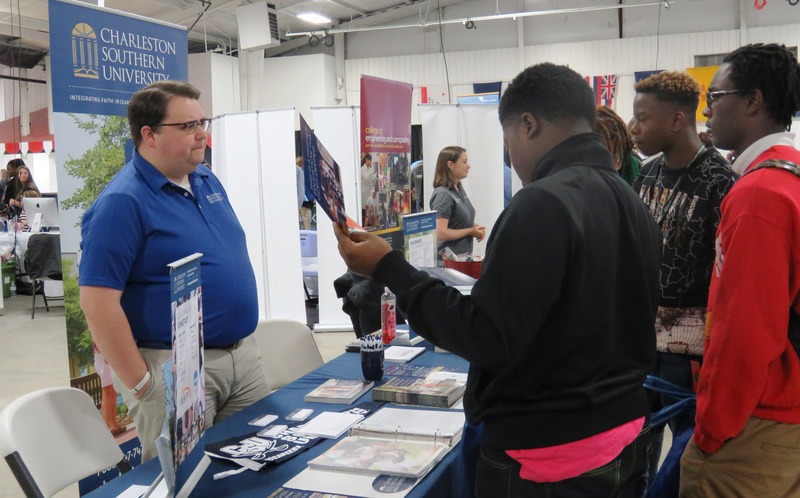 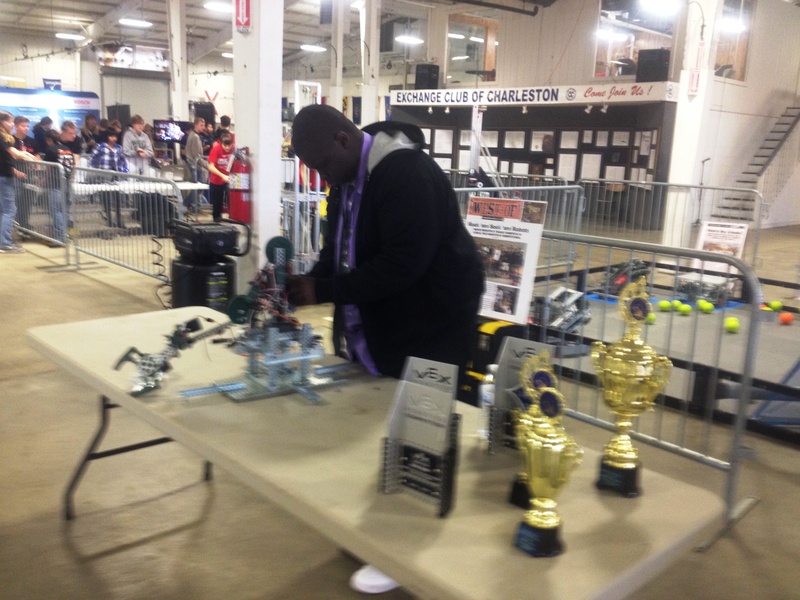 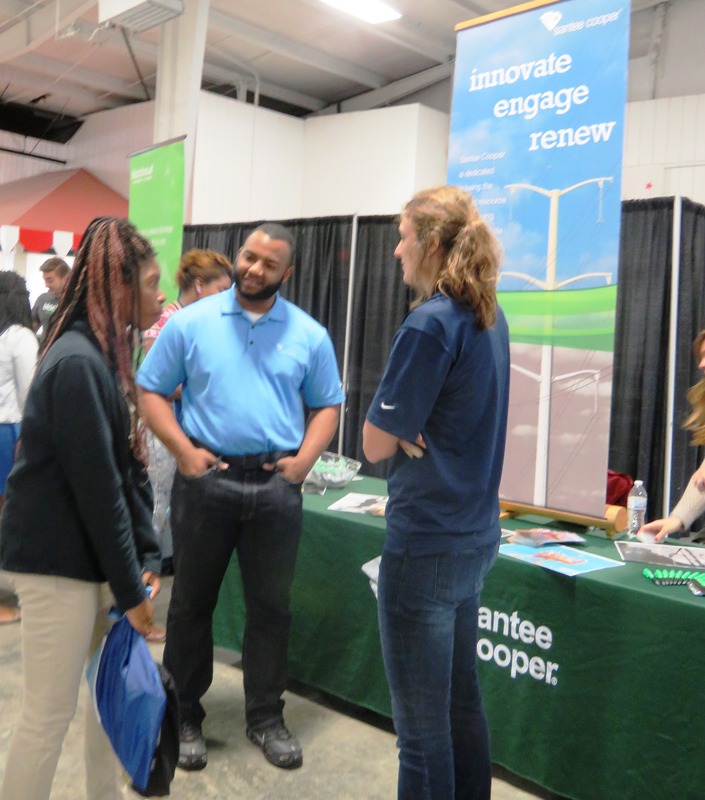 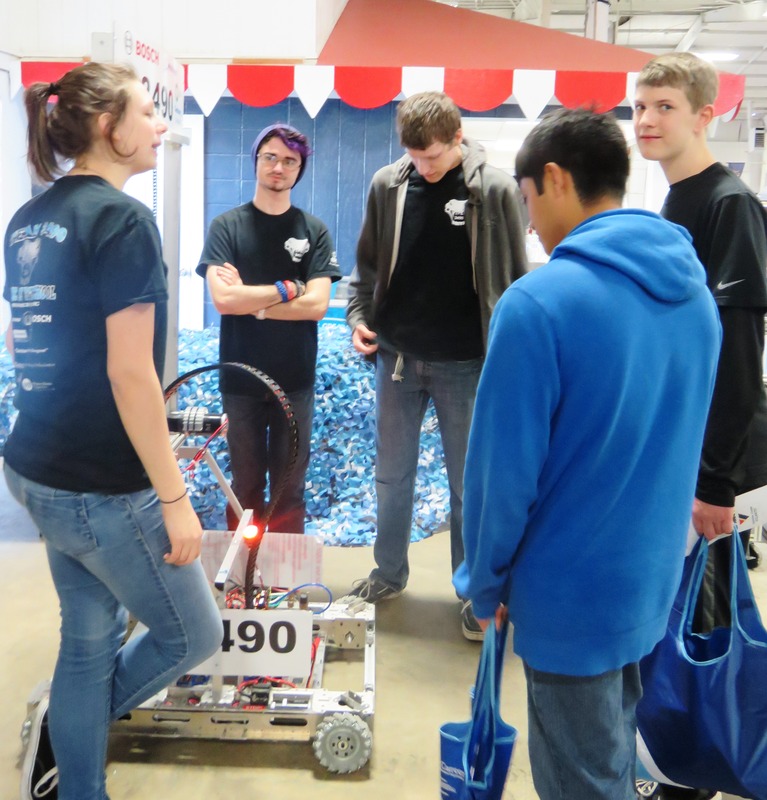 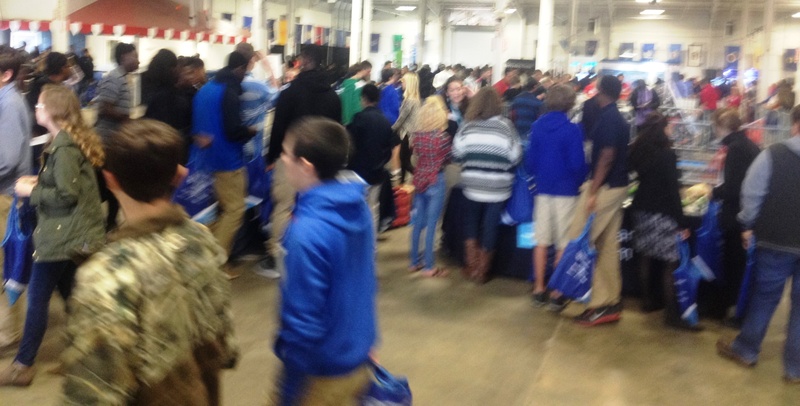 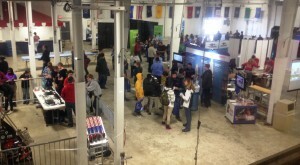 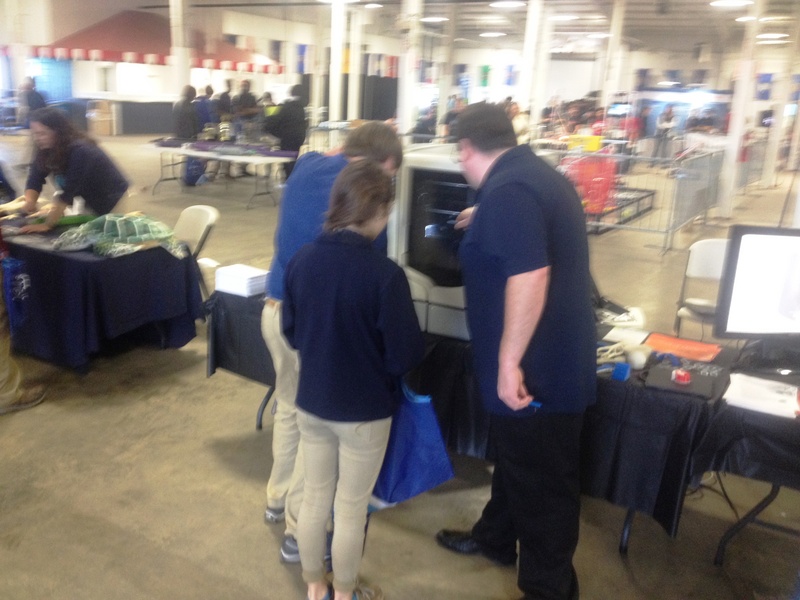 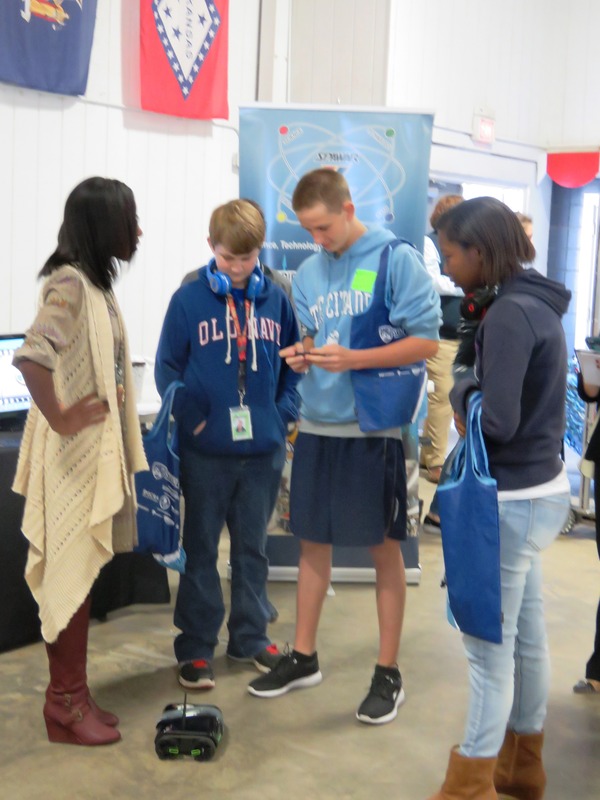 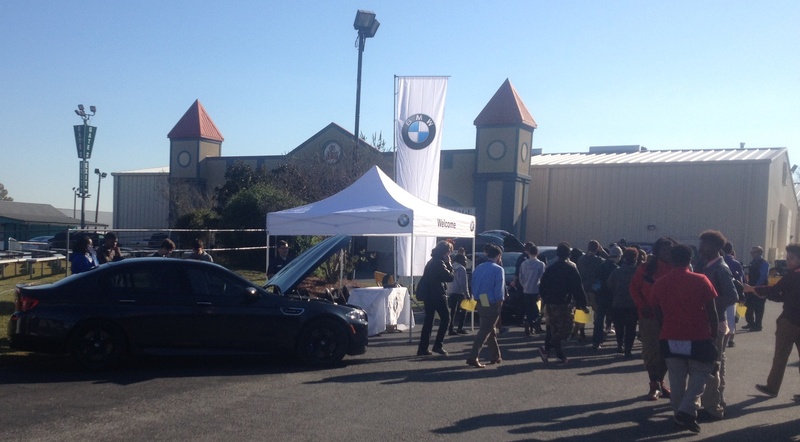 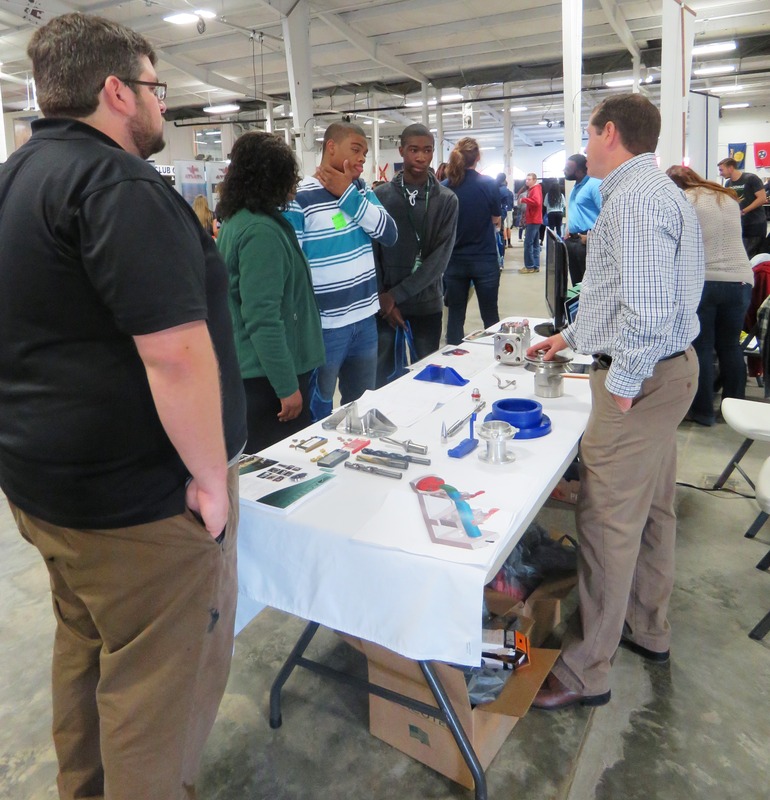 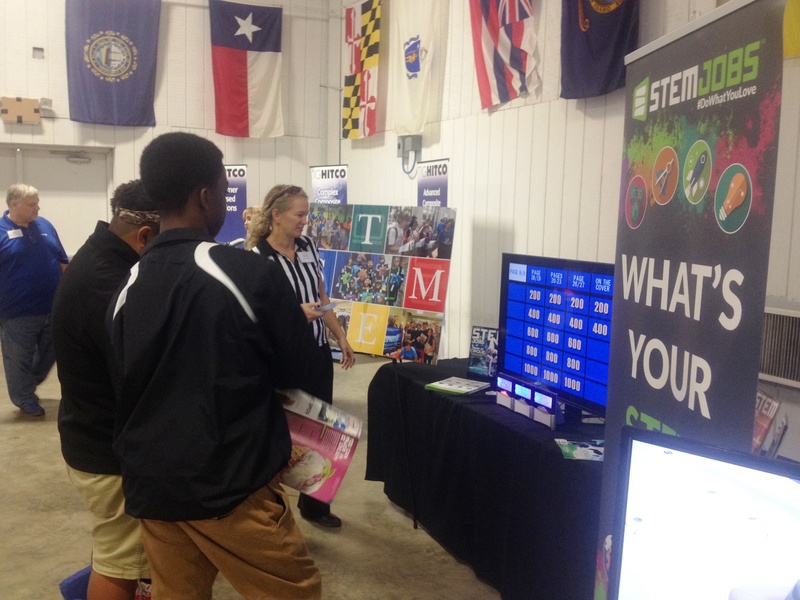 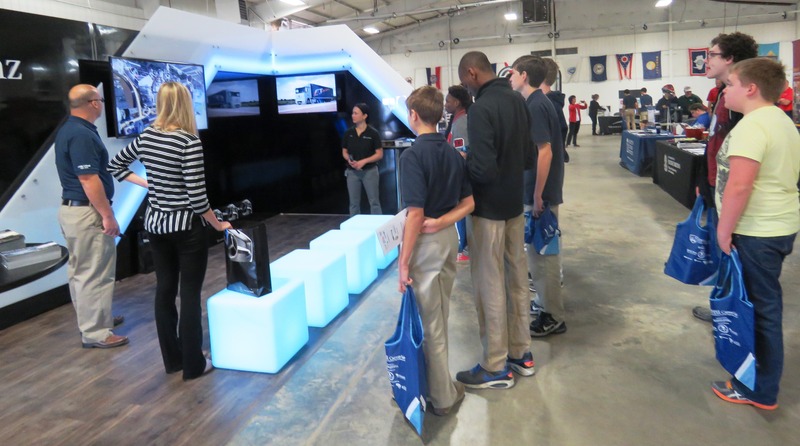 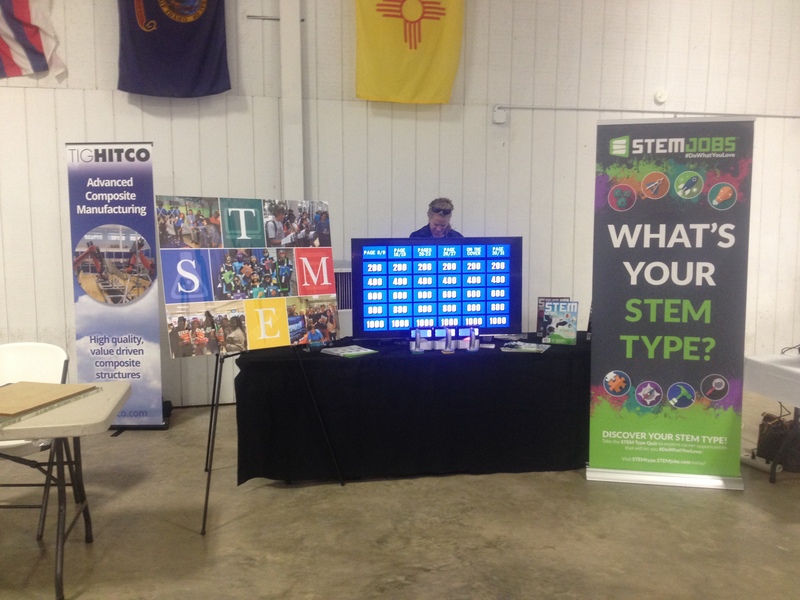 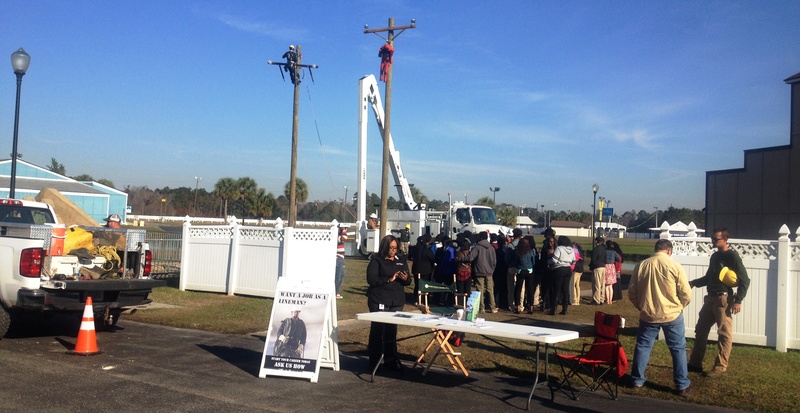 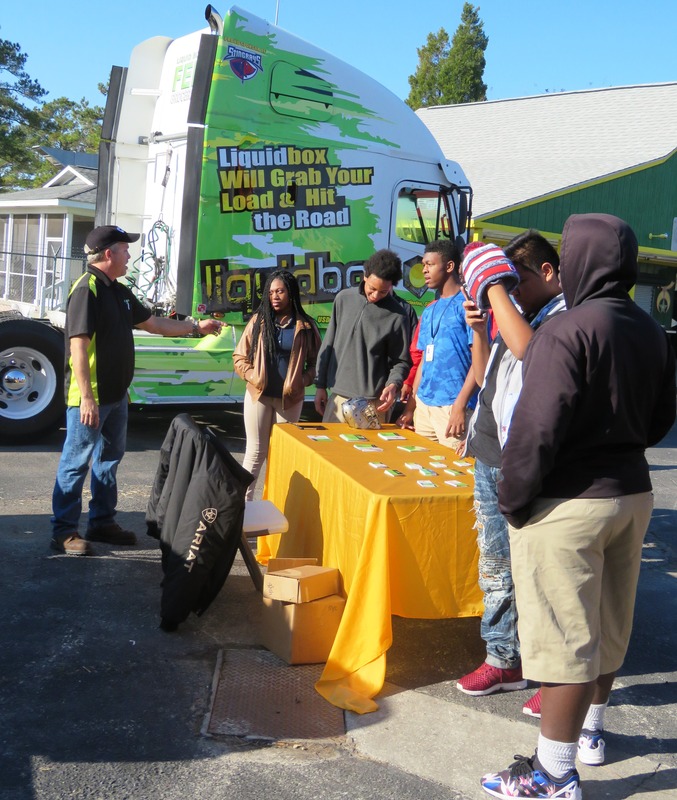 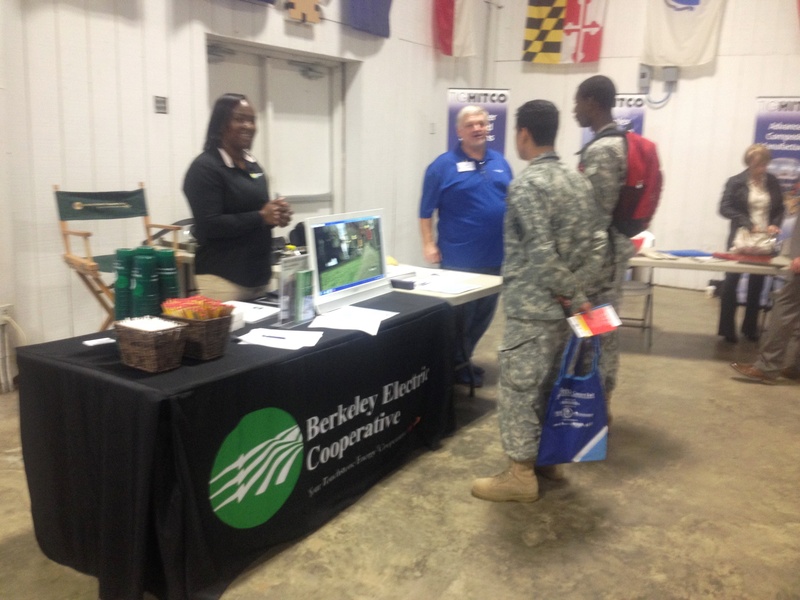 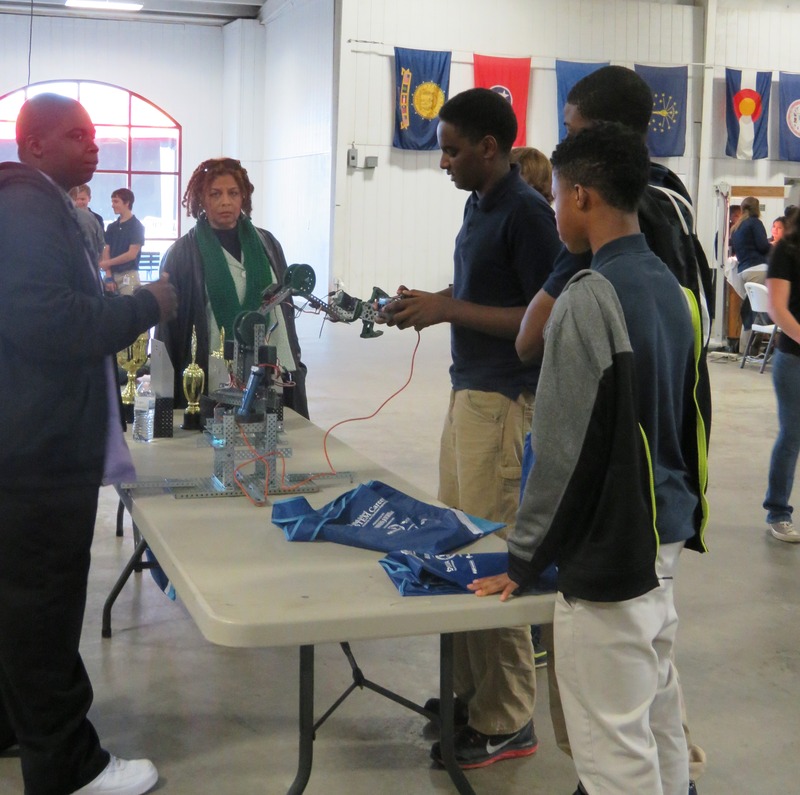 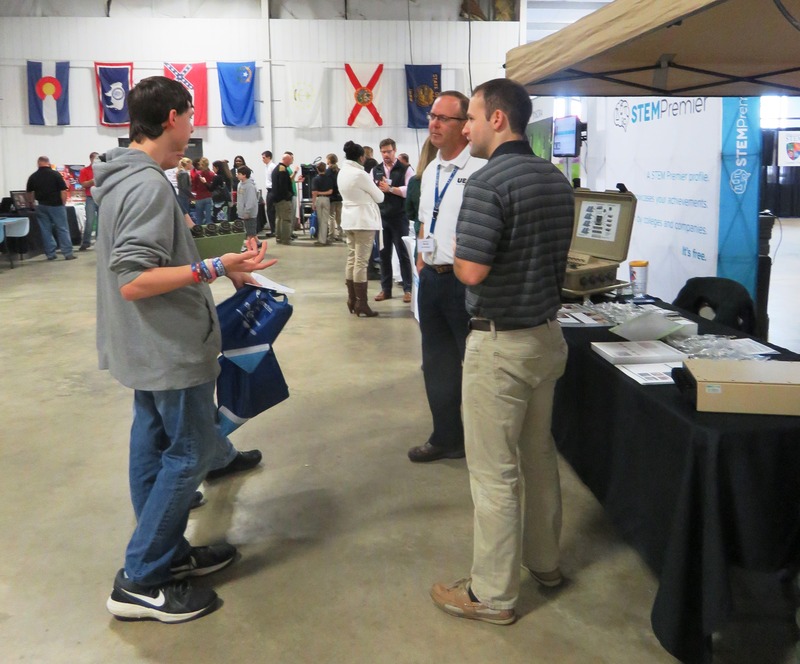 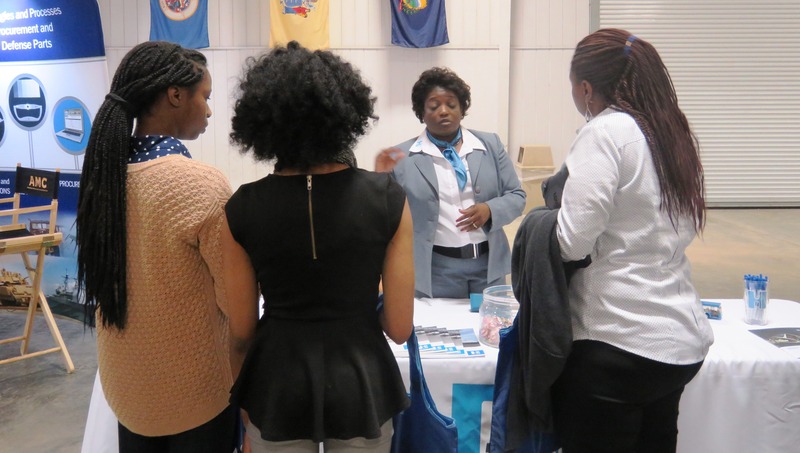 December 10, 2015 – Charleston, SC – Approximately 1000 students from throughout the Charleston region attended the inaugural High School STEM Career Fair held at Exchange Park Fairgrounds in Ladson. 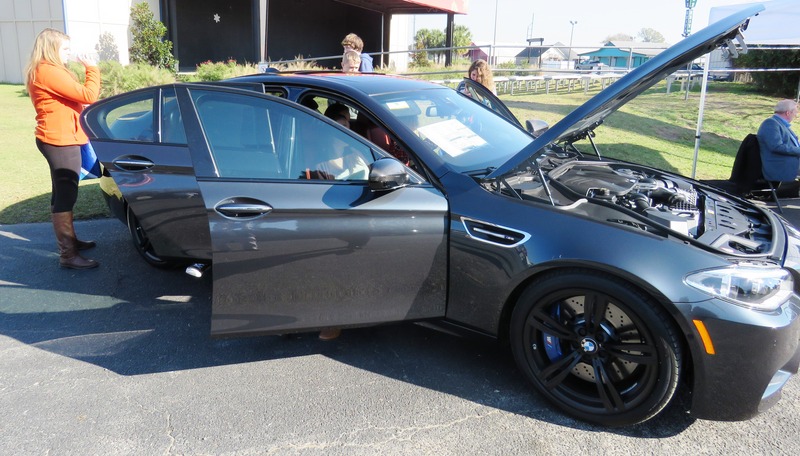 Over 40 local companies brought interactive exhibits with a goal of sharing the high demand, high wage workforce opportunities available right here in their community. 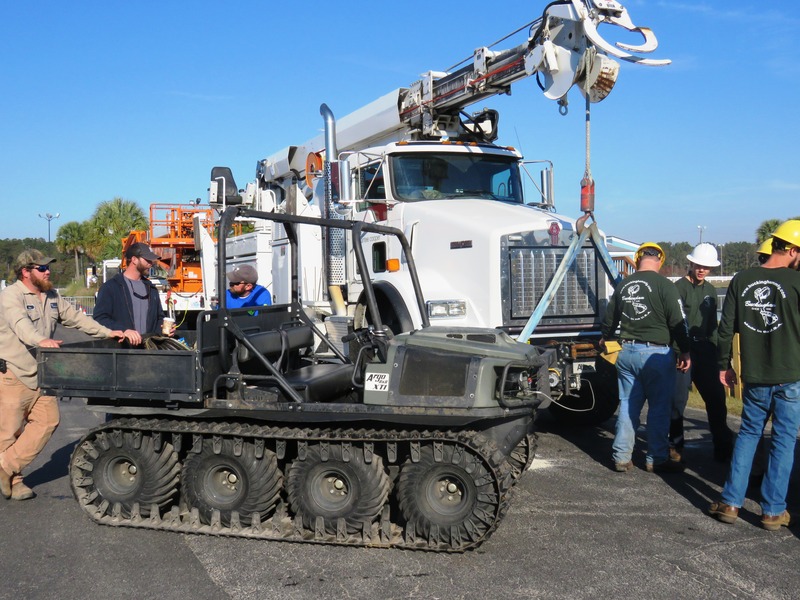 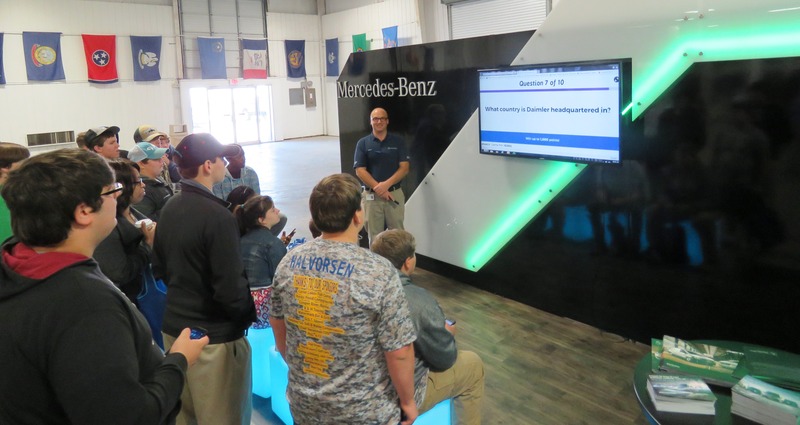 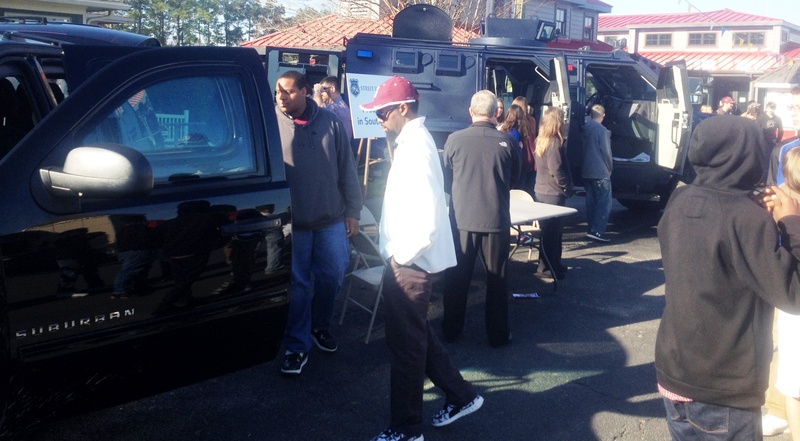 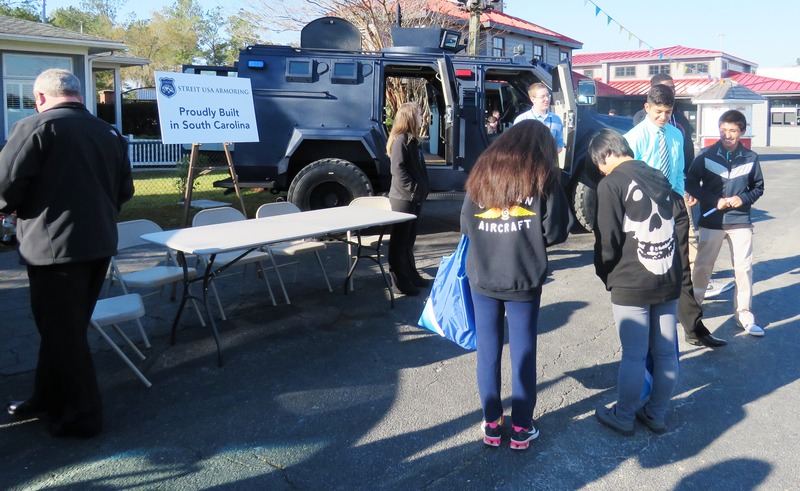 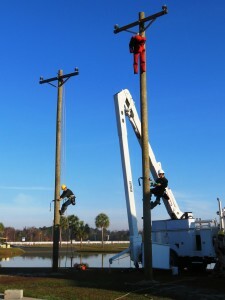 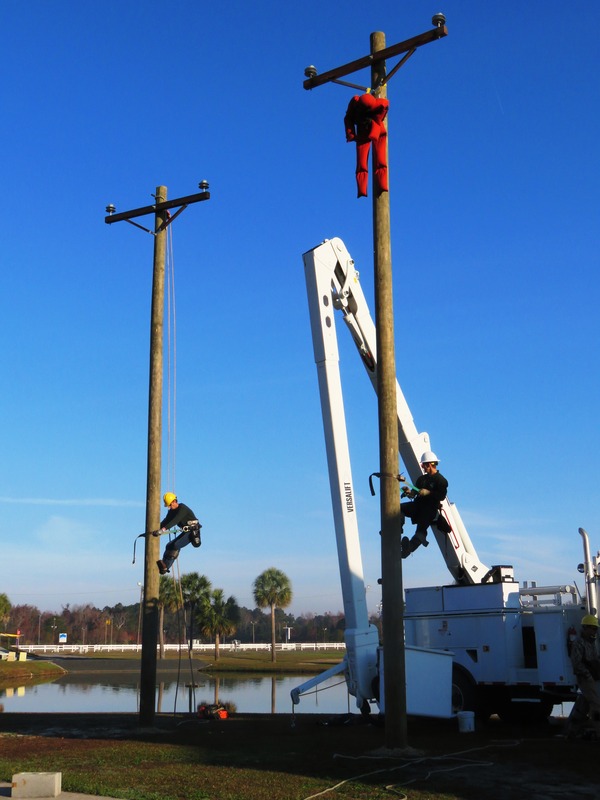 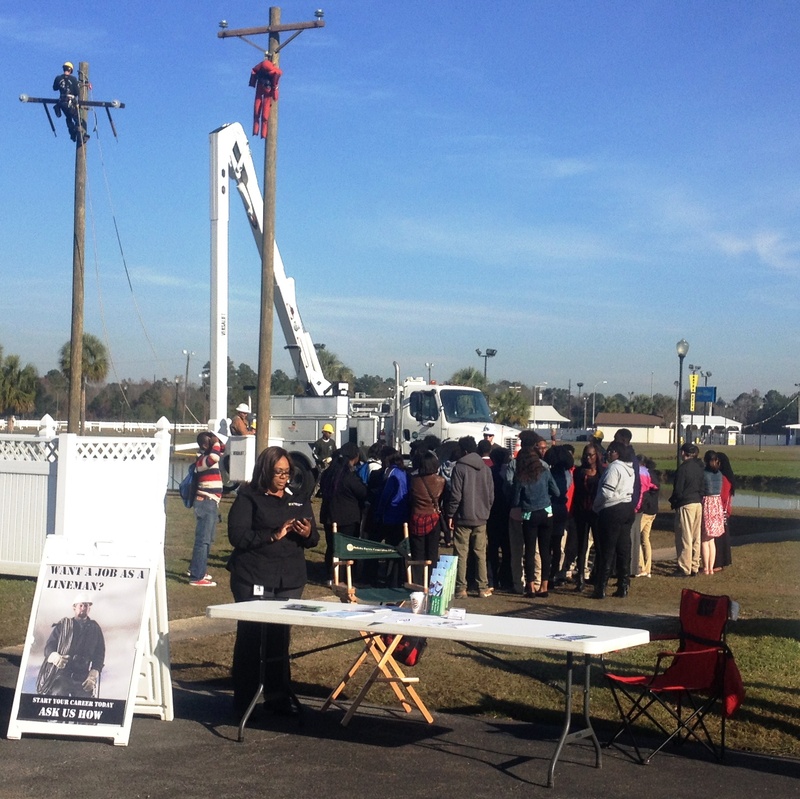 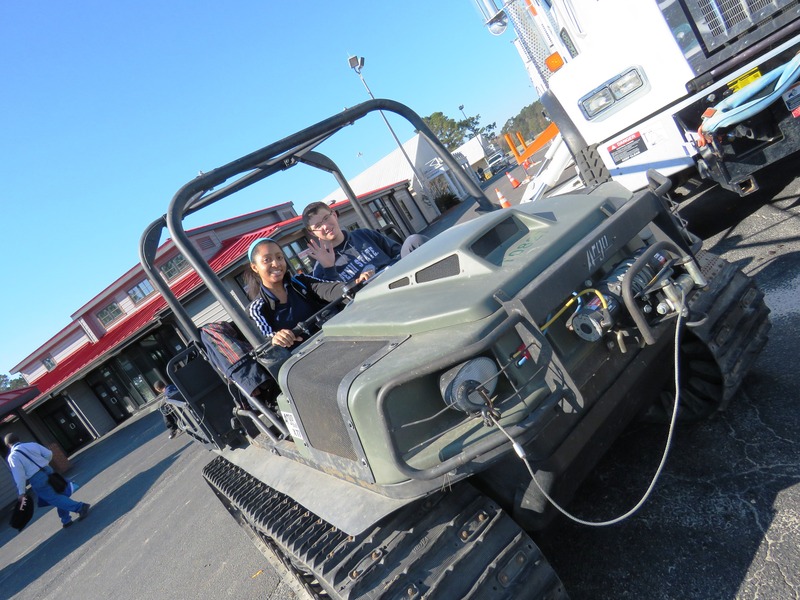 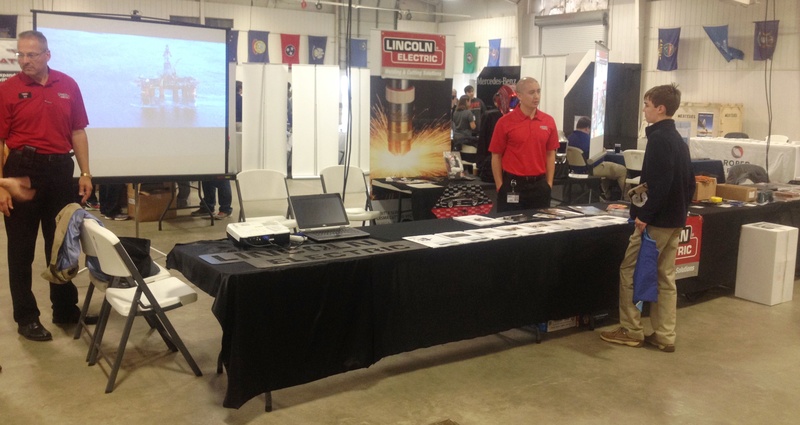 From electrical linemen doing demonstrations on utility poles to armored vehicles – there were many highlights to see before the students even entered the expo building! 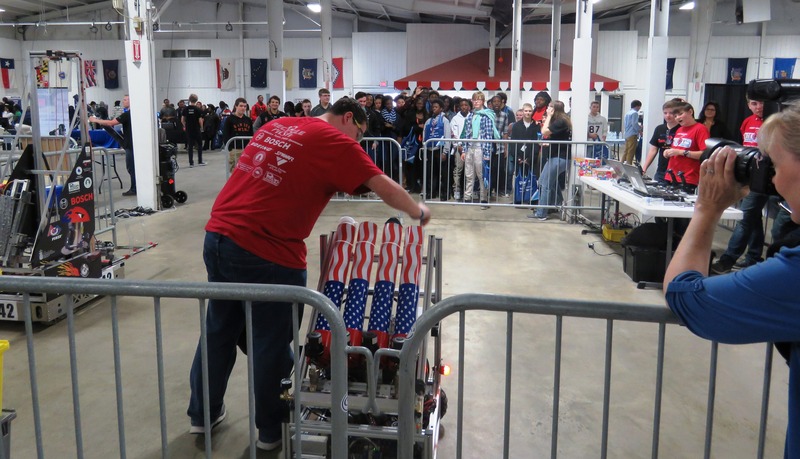 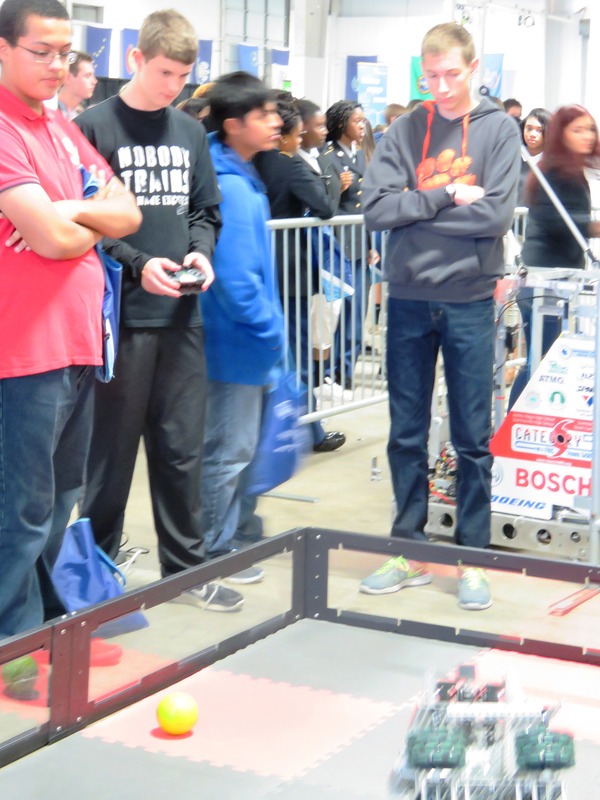 High school robotics teams from West Ashley HS, Cane Bay HS, Fort Dorchester HS, and Ashley Ridge/Summerville HS demonstrated their creations and even launched t-shirts into the crowds! 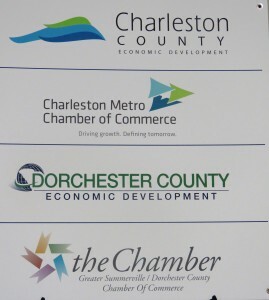 Thanks to Sonic Drive-In Dorchester Road, Raising Cane’s Chicken Fingers Summerville, Sam’s Club, and Coastal Coffee for the food & beverages. 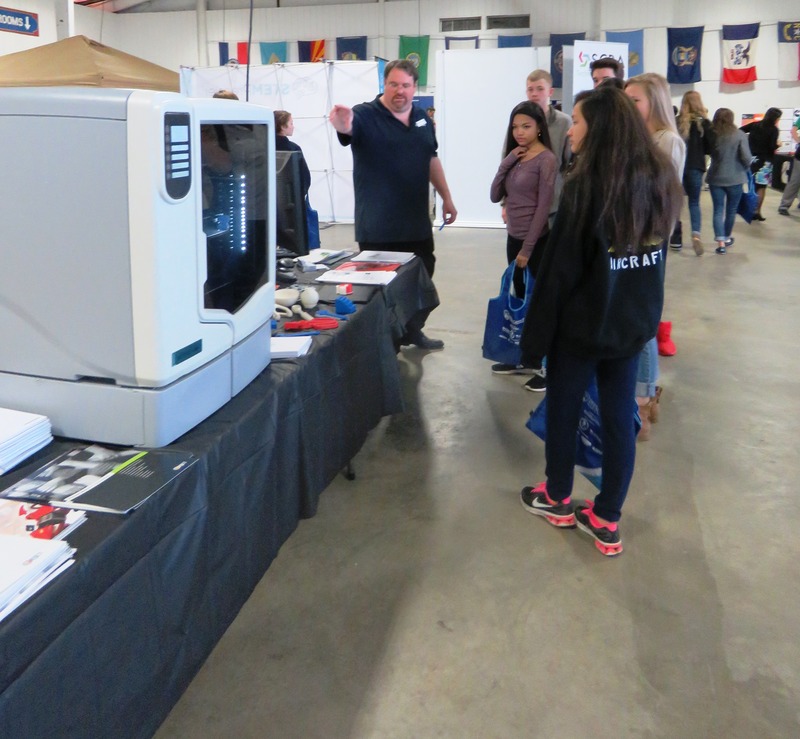 Thanks to all the cooperating school districts, economic development offices, and local colleges for their support for the event! 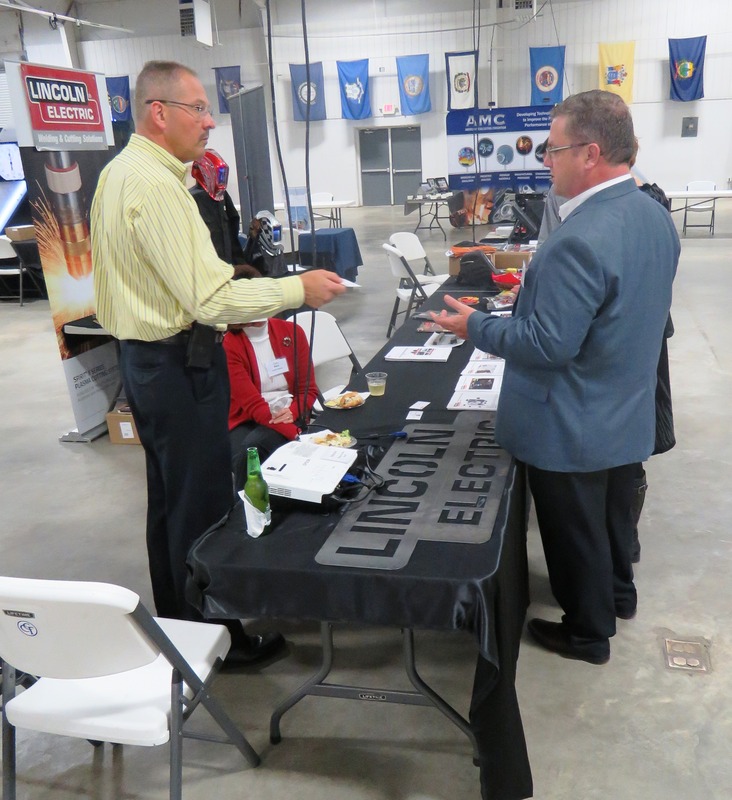 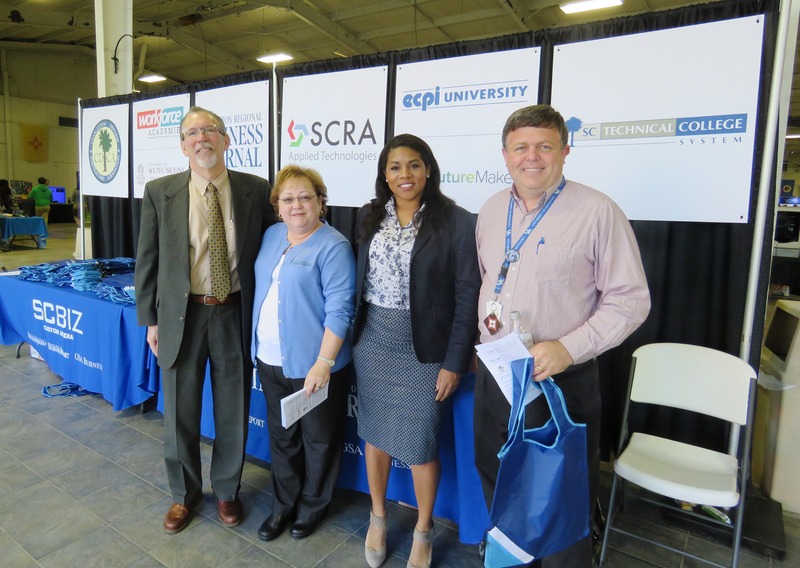 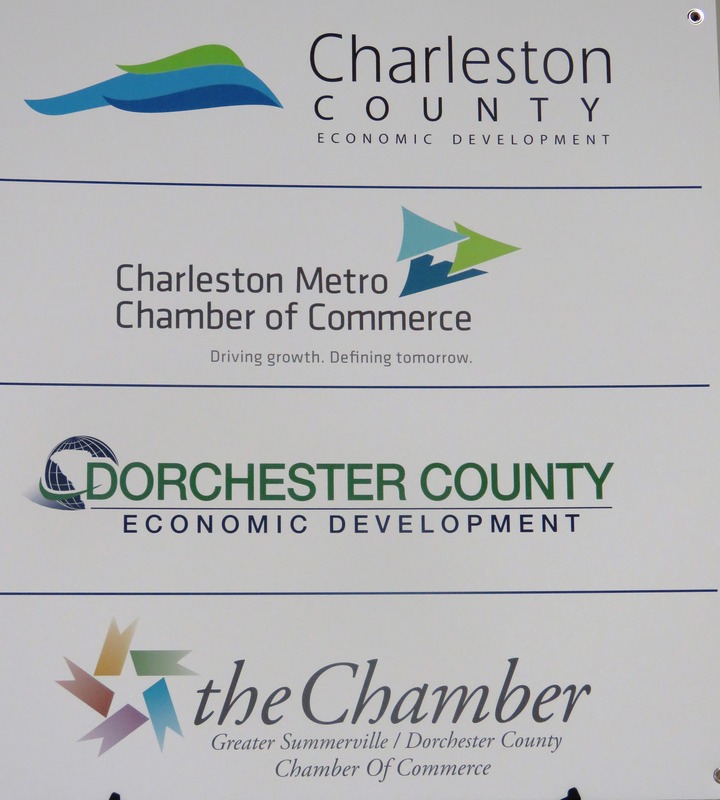 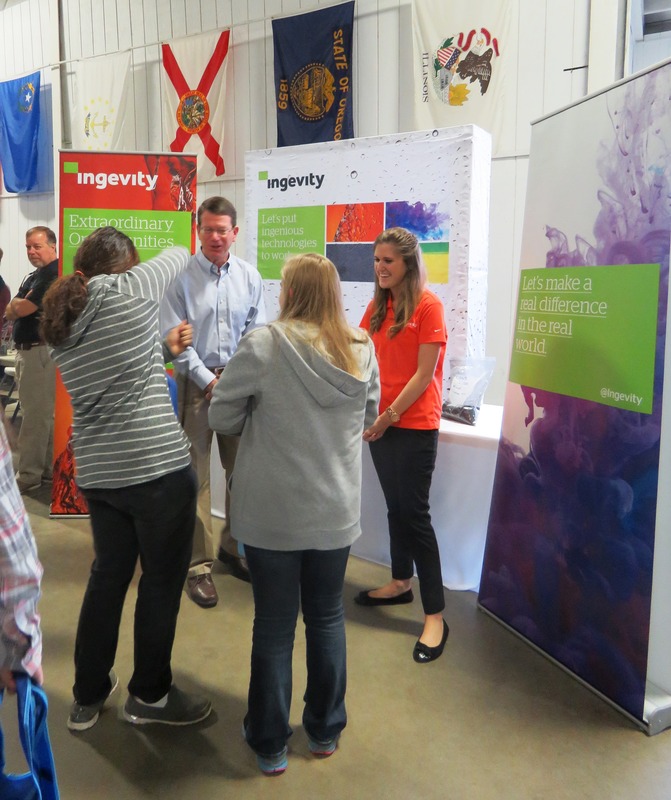 Thanks to the Exchange Park Fairgrounds for hosting the event, to Grady Johnson & the AMAZING SC Biz / Charleston Regional Business Journal Team for being the presenting sponsor, and all the sponsors and exhibitors that made the career fair possible – looking forward already to year #2! 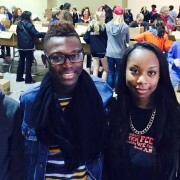 Students in West Ashley High School’s chapter of the Family, Career, and Community Leaders of America (FCCLA) recently helped pack boxes for the local Basket Brigade at the North Charleston Convention Center. 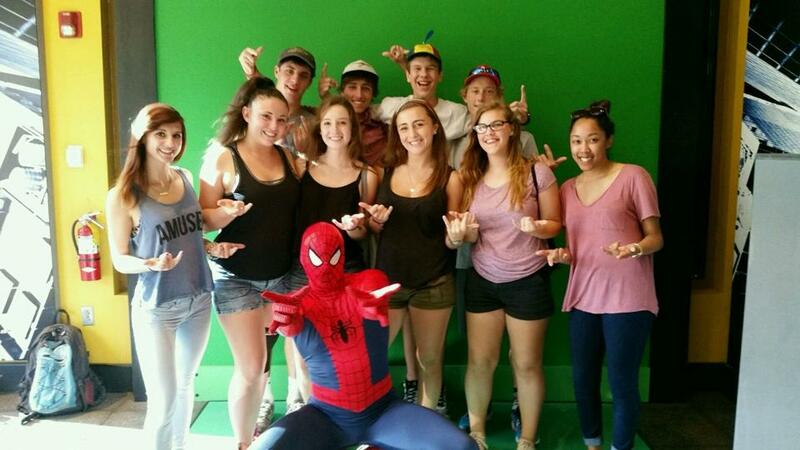 WAHS FCCLA’s 2015/2016 Chapter Service Projects are focused on helping the less fortunate. 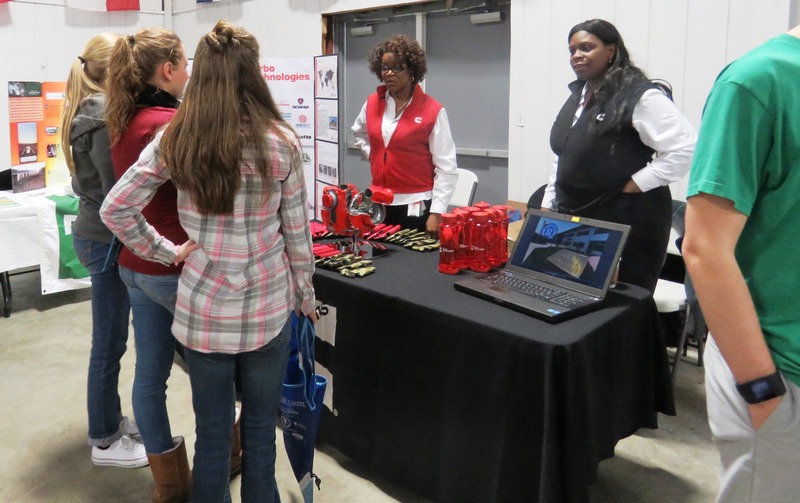 Later this year, FCCLA students will partner with local businesses and community outreach groups to ensure homeless citizens have nutritious food. They will also help host birthday celebrations for children living in local shelters. 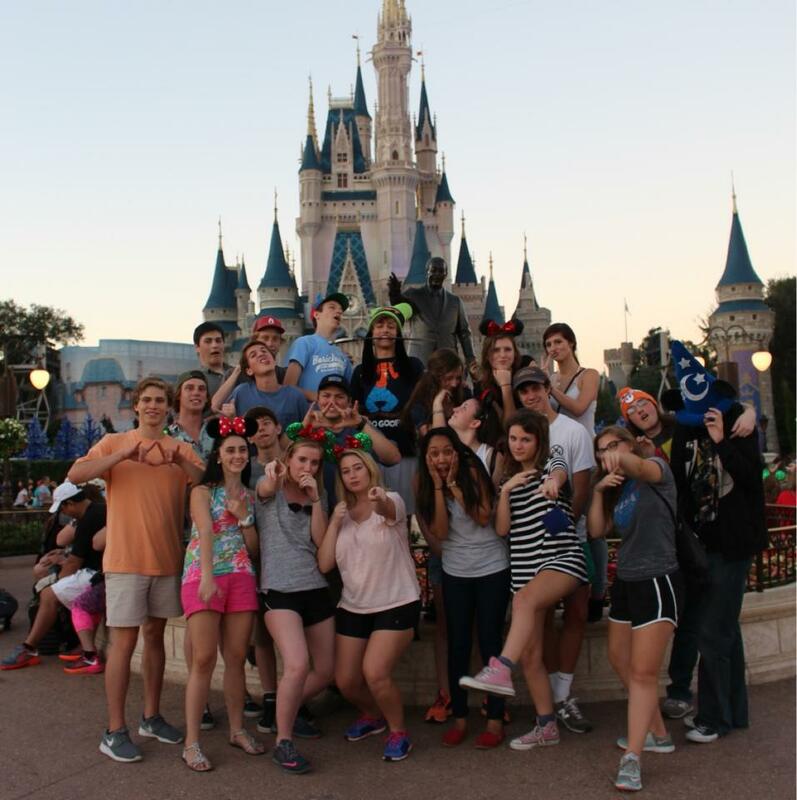 Students in Ms. Shawntell Pace’s broadcasting class at Wando High School recently attended the National Scholastic Press Association Convention in Orlando, Florida. 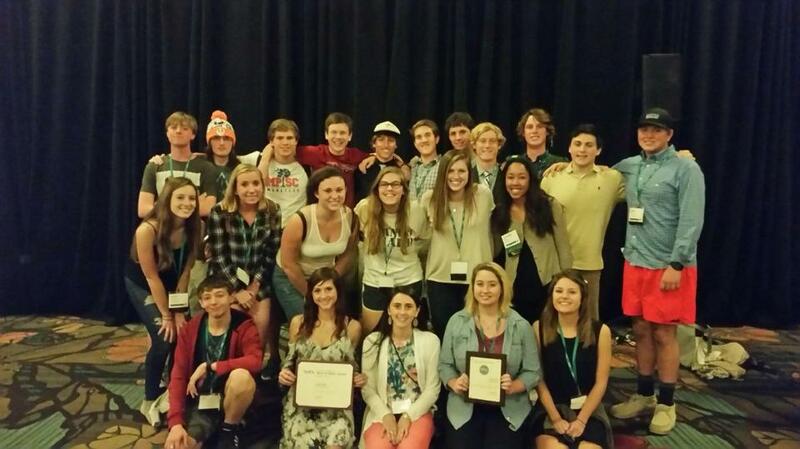 Tribe Talk, Wando HS’s student produced news program, placed 6th overall in the “Best of Show” category. 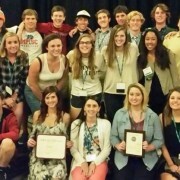 Wando’s Tribe Talk program was also one of the finalist for a Pacemaker award, which Ms. Pace described as the Pulitzer Prize for high school news shows. 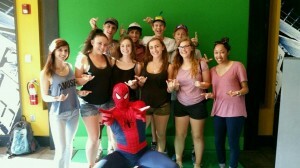 Ms. Pace shared these pictures of the students from their trip, and below is a video showcasing the Tribe Talk staff.